Within the city, you’ll like the Go’s light steering and small turning radius. The long-travel suspension is also absorbent enough, with the considerable ground clearance coming into play on really bad stretches of road. But the small wheels do crash through larger potholes and you can also always hear the suspension. The poor sound insulation is to blame. This becomes a bigger issue at highway speeds, where road and even wind noise become constant irritants. The lack of cladding in the rear wheel wells also means you can hear everything the tyres throw up at the body.Noise apart, the Go does make for a reasonably good highway car. Straight-line stability is very impressive for the most part (strong crosswinds do disturb its composure), and the steering feels adequately weighted too. It rolls a fair bit when pushed hard through corners, but the well-sorted dynamics and safe handling allow you to punt the Go around with confidence and ease. Just keep in mind that the Go comes without anti-lock brakes and that the tyres respond to emergency stops with lots of squealing and squirming. 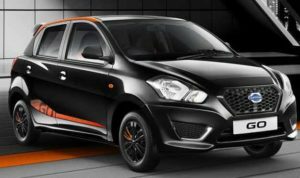 Were we to judge the Datsun Go relative to similarly sized hatchbacks, it would come across as a tad underwhelming. But you need to compare the Go to similarly priced competition; that&#8217;s when you&#8217;ll see it as a clever proposition. A spacious cabin and a big boot are two things you&#8217;ll rarely find in a budget hatchback, but it&#8217;s something you get with the Go. The car&#8217;s attractive styling, class-leading performance, ease of use and good fuel economy are also aspects that will interest buyers in the budget segment, the majority of whom are first-time car buyers. That&#8217;s not to say the Go doesn&#8217;t have its flaws. The ergonomics, for one, leave muchto be desired and there&#8217;s some essential kit missing. So there&#8217;s clearly a lot of room for improvement.